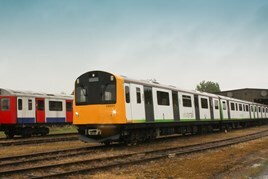 Vivarail has confirmed that the company’s first two completed D-Trains will be available for delivery early next year. Construction of the two trains is under way at the company’s workshop at Long Marston, where they will be made available as either two- or three-car units, and as either diesel or battery-powered variants. Offering the refurbished former London Underground D-Stock vehicles in a choice of motive power will enable operators to run the D-Trains on either electrified or non-electrified routes, although it is not yet known where they are likely to enter service. They are currently being advertised for sale.